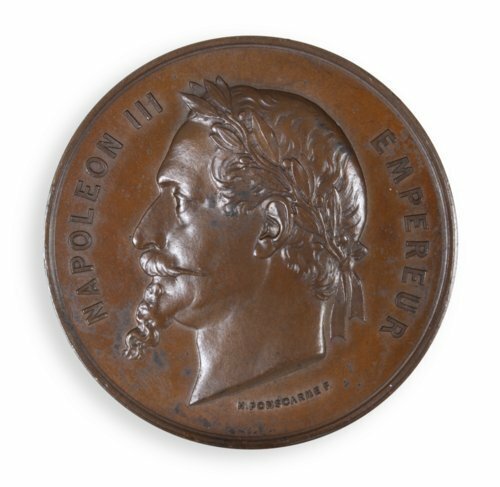 Bronze Napoleon III medal awarded to the State of Kansas at the 1867 Paris International Exposition. The front depicts the bust of Napoleon III, President and Emperor of France from 1848 to 1870. The reverse side reads, "Exposition Universelle De MDCCCLXVIII a Paris, Recompenses, Etat Du Kansas," which translates to "Universal Exposition of 1867 in Paris, Rewards, State of Kansas." The Paris Exhibition was held at the behest of Napoleon III and brought exhibitors to Paris from throughout the world. Though the reason the state received this medal is currently unknown, the French maintained strong ideological support for John Brown's abolitionist movement in Kansas. Hubert Ponscarme, a French sculptor, was commissioned to design this medal based on his success with a previous Napoleon III medal struck in 1857.